When it's time to treat yourself to a new cookware set, consider how often your cookware is used. This helps determine the level of durability needed for cooks who use pots, pans, and bakeware frequently. Today, a cook uses wholesale cookware sets for their strength and high value, as well as their good looks. There's nothing more satisfying than treating the avid cook to new cookware. A seven-piece stainless steel cookware with two and three-quart saucepans, a six-quart Dutch oven, and ten-inch stainless steel fry pan. The saucepans and Dutch oven have tempered glass lids. The Novice seven-piece stainless steel cookware set is light weight and offers the extra safety feature of an encapsulated aluminum bottom. This set includes one and two-quart sauce pans, a four-quart Dutch oven, and an 8 1/2" frying pan. 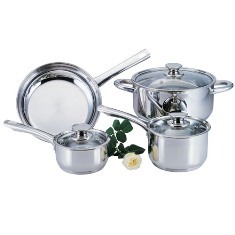 This cookware set comes complete with tempered glass lids and is mirror finished stainless steel. The mirrored finished keeps this cookware set looking bright and attractive with longer wear. For cooks who prefer aluminum cookware sets, Palmetto Linen offers an eight piece aluminum cookware set with a Whitford Xylan non-stick surface, made from thick gauge aluminum. This nonstick eight-piece aluminum cookware set also has a Whitford Xylan coating for a nonstick finish interior and exterior. The aluminum set includes a one and two-quart saucepan, a five-quart Dutch oven and two fry pans, 8" and 9 1/2" in size. Most cooks find uses for both types of cookware in their kitchens. Stainless steel cookware is great for faster cooking, pan braising and roasting. Aluminum cookware is best suited for slow cooking, stewing, braising and pan roasting. It's important to have a variety of sizes in sauce pans, Dutch ovens, and fry pans.